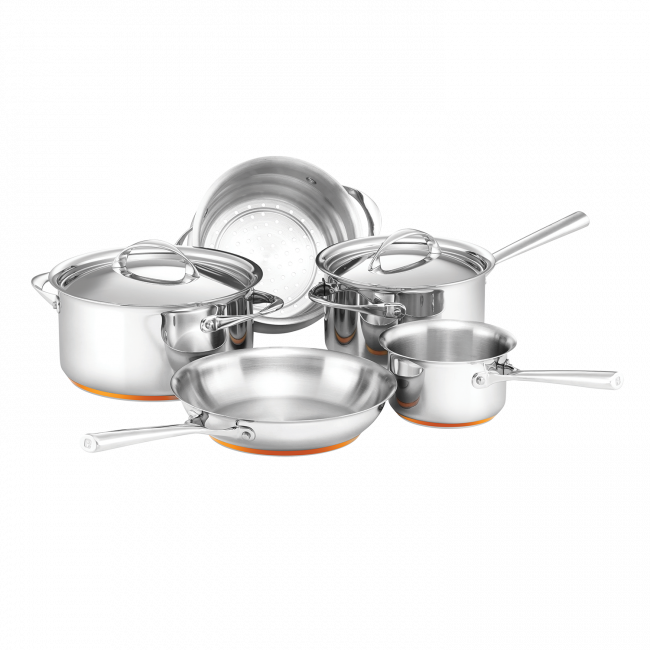 This high-quality Essteele Per Vita 5 Piece Cookware set is a must-have for every kitchen. Including two saucepans, a steamer and covered stockpot plus an Open French Skillet, this set provides the ultimate beginnings of a gourmet kitchen. Crafted from high quality stainless steel with a solid copper base for optimal heat control, the exceptional quality of Essteele Per Vita makes cooking a delight. The Per Vita collection combines Italian elegance with a 60 year Australian heritage, bringing you flawless, beautuful looking cookware that continually performs. Essteele Per Vita 5 Piece Cookware Set is rated 4.5 out of 5 by 39. Rated 5 out of 5 by Tilly from Exceptional! True and exceptional customer service! Company replaced my ageing set (30+ years!!!) as the handles are no longer manufactured and couldn't be replaced. Rated 5 out of 5 by Jackif from Exemplary customer service! After owning my Essteele saucepans for 28yrs they were replaced without question. I couldnt be happier. The old ceramic knobs had broken on my lids and after reading a glowing report in Choice magazine i called Essteele, told them my story and i was given an online voucher to replace my set of 3 saucepans. Their customer service was the best i have ever seen. I now am the proud owner of a beautiful new set of incredible cookware with tears of joy. I know what my children will all be getting for their wedding presents in the near future. I can't recommend this company highly enough. Thankyou Essteele. Rated 5 out of 5 by cupcakes1974 from Best cookware set I have ever bought Works so well with my induction cook top. Cooks evenly and cleans easily. Rated 5 out of 5 by Livi from Brilliant! I brought these a few weeks ago and love love love them! Look stunning! Wash easily! Solid structure! ( slightly heavier than I'm used too, but I feel that adds to the quality! Thank you for making such a great product and keeping it at such an affordable price!! Don't change a thing! Rated 5 out of 5 by Dennis from Great features! I bought this 2 weeks ago and I'm glad that I did, it is easy to use and very easy to clean. Rated 5 out of 5 by Style Plus from Super Saucepans This saucepan set by is brilliant. I previously has a saucepan set by Essteele and had always been very happy with them. However after 30 years I thought it was time for an update and at the sale price that Myer offered it was a great buy. These saucepans are heavier than my previous Essteele ones, but being made a high quality stainless steel, that is to be expected. The food cooks quickly and very evenly and the saucepans are easy to wash. They are supposed to be able to be put in the dishwasher, but I am a bit old fashioned and am happy to wash them by hand and they have come up looking very bright and shiny every time. For those into cooking, I would thoroughly recommend them. Whilst expensive at a non sale price, these saucepans will last a lifetime of cooking and give much satisfaction. Rated 5 out of 5 by SamanthaduP from Great starter pot set This pot set is the perfect setup for anyone starting their kitchen from nothing. The quality is exceptional and the range in pot size means I haven’t actually had to buy anything else. It has everything I need. The pots heat up really quickly and are very easy to clean. I’m super happy with them.